ALREADY A MEMBER? GET YOUR LOGIN HERE. A member organization, diamond traders seeking to join the Antwerpsche Diamantkring must demonstrate their probity and good reputation. The possibility – to rent a safe in the large and secure safe deposit facility. Easily buy and sell diamonds – to Bourse members who are known and respected in the jewelry industry. Network – with leading diamond dealers, brokers, jewelry manufacturers and leading industry stakeholders. The right to state your membership – of the Antwerpsche Diamantkring on your stationary, website and other communication channels. Every candidate must provide a complete application form and all necessary documents. The prospective new member is first interviewed by 2 Board members of the Antwerpsche Diamantkring. After which the application is discussed and voted by the full Board. We welcome you to the next edition of the Antwerp Rough Diamond Days. This unique business-to-business trading event completely dedicated to rough diamonds, takes place in our magnificent trading hall. Participating in the vibrant Antwerp Rough Diamond Days gives you direct access to the world’s largest rough diamond trading center and its leading dealers. The most cost effective way to do good business. 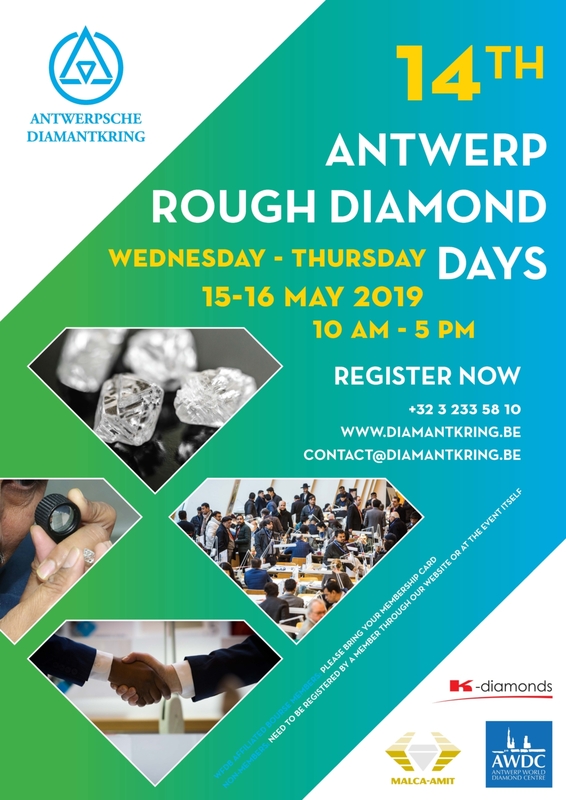 The Antwerp Rough Diamond Days encourages WFDB diamond dealers trading in rough diamonds to come down to our trading floor and engage with each other during this unique two day event. 50 exhibitors and hundreds of buyers from Belgium, Israel, India, China and many other countries are taking part. Don’t miss the opportunity to connect with new colleagues and long-time customers in person. The large amount of available goods in all shapes and sizes at the Antwerp Rough Diamond Days gives preferential access to the world’s leading rough diamond market. Hundreds of national and international buyers know that the broad range of goods available at this event, makes it a unique opportunity to do business. Previous editions proved to be very successful for exhibitors and buyers, by focusing on the essence of the diamond business: it being a people business, with direct trading of rough diamonds between willing buyer and seller. In the secure ADC building members and non-members can rent a safe deposit box. Top-notch security in place and discrete facilities for handling your belongings. Safe deposit boxes are available in various sizes. The Young Diamantaires of Antwerp provides a platform for the under 40 generation of diamantaires, polishers, jewelry manufacturers and diamond industry professionals living and working in Antwerp. The YDA will facilitate business opportunities, offer courses across a range of topics, organize networking events and give a voice to the young diamond set of Antwerp. We will share knowledge, opportunity and contacts, adding vibrancy to the Antwerp and global diamond industry whilst encouraging future leaders to play a role in expanding and strengthening our trade and promoting integrity and transparency.